Davor Božinović is a member of the Croatian Parliament and previously served as Croatian Minister of Defense and Deputy Foreign Minister.Božinović holds a PhD in International Relations from the University of Zagreb, where he also acquired his masters and undergraduate degree at the Faculty of Political Science. 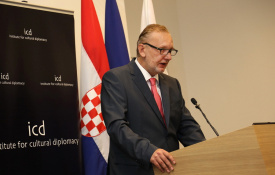 He served as Ambassador of the Republic of Croatia to Serbia and Montenegro from 2002 to 2004. In 2004 he was appointed as Head of the Office of the President of the Republic of Croatia. From 2005 to 2008 he was the Head of Mission of the Republic of Croatia to NATO. 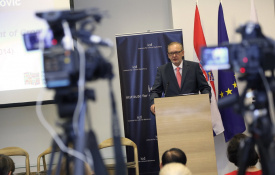 That same year, Božinović was appointed State Secretary for European integration at the Ministry of Foreign Affairs and European integration (MVPEI). In July 2009, he moved over to State Secretary for Political Affairs at the Minstry of Foreign Affairs. "Applied Cultural Diplomacy in Southeast Europe"